Teotihuacan was founded around 100 BCE and reached its peak population around 450 CE. Teotihuacan was a multi-ethnic city, with distinct quarters occupied by Otomi, Zapotec, Mixtec, Maya and Nahua peoples. 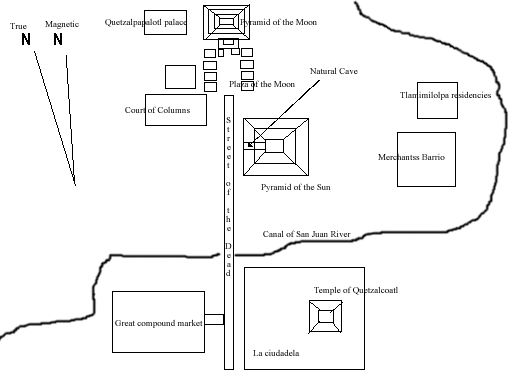 The geographical layout of Teotihuacan is a good example of the Mesoamerican tradition of planning cities, settlements, and buildings as a reflections of their view of the Universe. The largest building in Teotihuacan, which measures 246 feet high and 736 feet wide. A large precolumbian Mesoamerican city known for its archeological significance. This deity was one of the central icons of Teotihuacano religious culture. She appears in painted murals with images associated with the underworld, birth, death, and creation. Just 30 miles from modern day Mexico City lies the precolumbian Mesoamerican city of Teotihuacan. It is famous for its pyramids and series of accompanying residential compounds, but was once much more than an archaeological and tourist site. Archaeological evidence suggests that Teotihuacan was a multi-ethnic city, with distinct quarters occupied by Otomi, Totonac, Zapotec, Mixtec, Maya, and Nahua peoples. In 2001, Terrence Kaufman presented linguistic evidence suggesting that an important ethnic group in Teotihuacan was of Totonacan or Mixe–Zoquean linguistic affiliation. Other scholars maintain that the largest population group must have been of Otomi ethnicity, because the Otomi language is known to have been spoken in the area around Teotihuacan both before and after the classic period and not during the middle period. Although it is a subject of debate whether Teotihuacan was the center of a state empire, its influence throughout Mesoamerica is well documented; evidence of Teotihuacano presence can be seen at numerous sites in Veracruz and the Maya region. Many Maya murals represent Teotihucuan and the leaders of the city during its zenith. The Aztecs were also heavily influenced by the architecture, culture, and lore of this ancient city, claiming common ancestry with the Teotihuacanos and adopting some of their artistic and architectural styles. The city and culture, which can be referred to as Teotihuacan or Teotihuacano, is thought to have been established around 100 BCE, with major monuments continuously under construction until about 250 CE. It began as a new religious center in the Mexican Highland and a large population was drawn to the city over a few centuries. It may have lasted until sometime between the 7th and 8th centuries CE, but its major monuments were sacked and systematically burned around 550 CE. At its zenith, around the first half of the first millennium CE, Teotihuacan was the largest city in the pre-Columbian Americas, with a population estimated at 125,000 or more. It’s varied population made it, at minimum, the sixth largest city in the world during its epoch. The city eventually included multi-floor apartment compounds built to accommodate this large population. The founders of this religious and populous city remain a mystery to scholars of the area. Some have speculated that the Xitle volcano, which is located southwest of modern-day Mexico City, may have prompted a mass emigration out of the central valley and into the Teotihuacan valley. These displaced settlers may have founded, or at least helped grow, the city. An alternate explanation is that the Totonac people, who still remain today, founded Teotihuacan. There is also evidence that at least some of the people living in Teotihuacan immigrated from those areas influenced by the Teotihuacano civilization, including the Zapotec, Mixtec, and Maya peoples. Mural of the Great Goddess of Teotihuacan. This powerful goddess was associated with darkness, mystery, death, and creation. She was often depicted with owls, jaguars, and spiders, all creatures of the earth, darkness and the underworld. This mural is from the Tetitla compound at Teotihuacan. As a religious center, Teotihuacan displayed its most prominent gods and goddesses in murals and architecture. The Great Goddess of Teotihuacan appears to be the most prominent of these deities, and she likely represented the underworld, war, creation, water, and the earth. Evidence of human sacrifices to honor the completion of buildings or special times of year has also been uncovered by archeologists. Captives from wars were decapitated, had their hearts removed, were bludgeoned, or were buried alive to commemorate these momentous occasions. Pyramid of the Sun. This giant pyramid dwarfs the smaller platforms surrounding it and was the largest building at Teotihuacan. The city’s broad central avenue, called “Avenue of the Dead” (a translation from its Nahuatl name Miccoatli), is flanked by impressive ceremonial architecture, including the immense Pyramid of the Sun (third largest in the World after the Great Pyramid of Cholula and the Great Pyramid of Giza) and the Pyramid of the Moon. Along the Avenue of the Dead are many smaller talud-tablero platforms. The Aztecs believed they were tombs, inspiring the Nahuatl name of the avenue. Pyramid of the Moon. This pyramid is the second largest in Teotihuacan. Further down the Avenue of the Dead is the area known as the Citadel, containing the ruined Temple of the Feathered Serpent. This area was a large plaza surrounded by temples that formed the religious and political center of the city. Most of the common people lived in large apartment buildings spread across the city. Many of the buildings contained workshops where artisans produced pottery and other goods. Teotihuacan City Plan. The layout of Teotihuacan exemplifies Mesoamerican urban planning. The geographical layout of Teotihuacan is a good example of the Mesoamerican tradition of planning cities, settlements, and buildings as a reflection of the Universe. Its urban grid is aligned to precisely 15.5º east of North. One theory says this is due to the fact that the sun rose at that same angle during the same summer day each year. Settlers used the alignment to calibrate their sense of time or as a marker for planting crops or performing certain rituals. Another theory is that there are numerous ancient sites in Mesoamerica that seem to be oriented with the tallest mountain in their given area. This appears to be the case at Teotihuacan, although the mountain to which it is oriented is not visible from within the Teotihuacan complex due to a closer mountain ridge. Pecked-cross circles throughout the city and in the surrounding regions indicate how the people managed to maintain the urban grid over long distances. It also enabled them to orient the Pyramids to the distant mountain that was out of sight. There is an ongoing debate about why Teotihuacan collapsed and the population abandoned this city center. Evidence of climate changes, which caused severe droughts around 535 CE, suggest there was a general population decline in the region. In fact, archeological digs have revealed juvenile skeletons with signs of malnutrition, which probably forced populations to move and caused internal social strife. Further archeological evidence reveals that only the buildings associated with the elites along the Avenue of the Dead were sacked and burned. This type of activity suggests there might have been internal unrest and possibly a revolt against the elite power structure, which caused the collapse of the city.